The Hospital and Ambulance Flags of the Army are established as follows: For General Hospitals, yellow bunting 9 by 5 feet, with the letter H, 34 inches long, of green bunting, in centre. For Post and Field Hospitals, yellow bunting 6 by 4 feet, with letter H, 24 inches long, of green bunting, in centre. For ambulances and guidons to mark the way to Field Hospitals, yellow bunting 14 by 28 inches, with a border, one inch deep, of green. 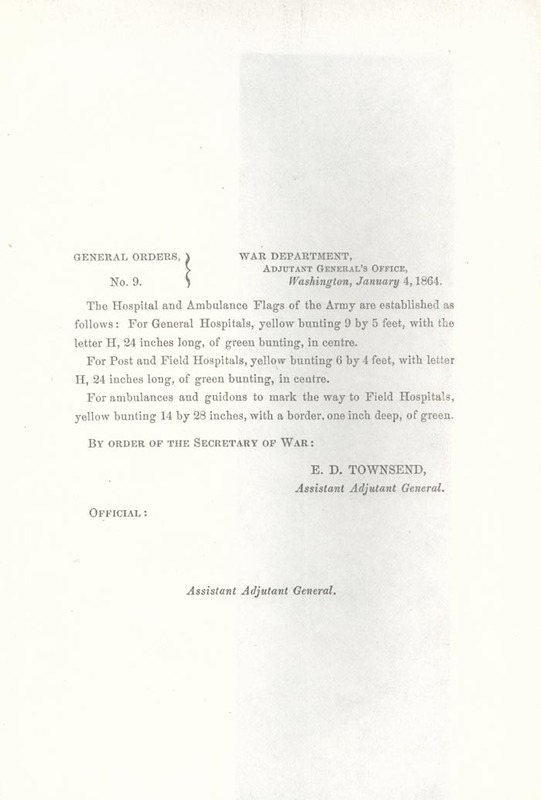 Adjutant General's Office, Washington, January 4, 1864.